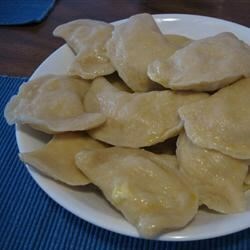 "I grew up on these delicious perogies. I make 3 batches of dough for this recipe and freeze some. You can have perogies just boiled, or you can fry them in butter, which makes them tastier. Serve with sour cream or cottage cheese. Hint: To freeze perogies, freeze separately first, then put in freezer bags. Otherwise, they will all stick together." Roll reserved dough out on a floured surface. Cut circles out of dough, using a small round container. Place a spoonful of potato or sauerkraut filling in the center of each circle and fold over, pinching edges together to seal. Bring a large pot of lightly salted water to a boil; drop perogies in boiling water and cook for 4 to 5 minutes, or until they float. See how to make traditional potato and cheese-filled perogies. I used this recipe only for the dough, and added some fresh cracked pepper for a little flavour. Make sure you keep the dough thick enough, or they all fall apart when boiled! Very good. But you need to fry them after you boil them. It tastes so much better. Very good but I ommited the Kraut. And after I boiled them added melted butter and sprinkled with a little garlic salt.